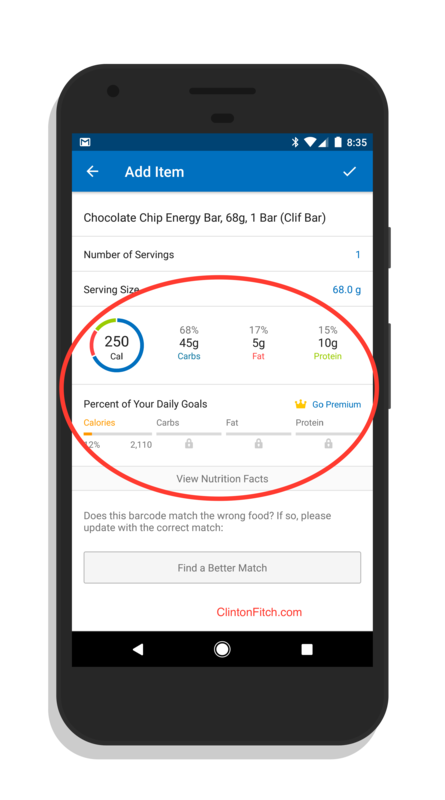 The calorie and diet tracking app MyFitnessPal has an update rolling out to Android users that will more granular nutrition information to your diary entries. When you add an item to your diary, be it from a manual entry or a barcode scan, the app will now give you information such as calories, carbs, fat and protein in that item. It will also give you the percentages of your daily goals in these areas with everyone getting calorie percentages while Premium subscribers get carbs fat and protein percentages. The information is aimed at helping you make informed and wise food and drink decisions to maintain a healthy lifestyle. poor diet but also a general lack of exercise. MyFitnessPal was a key tool that I used in more-or-less relearning how and what to eat. The result? Today I weighed in at 198lbs and have logged in MyFitnessPal for 1,526 consecutive days. Even if you are not in the situation where I was in that I had to lose weight, MFP is a great way to just track what you eat every day so you can follow your calories and your overall nutrition. It also links into Google Fit and Fitbit so you can have it track you exercise and give you calorie credit back for that workout. MyFitnessPal is free to use and you can download it from the Play Store. The premium subscription is $9.99/month and it opens up more of the nutritional information to you along with other benefits. You can buy that in the app but it is not required. For those who have it installed, look for the OTA update to hit your device over the course of the next few days.